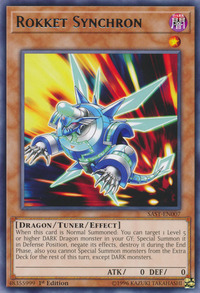 When this card is Normal Summoned: You can target 1 Level 5 or higher DARK Dragon monster in your GY; Special Summon it in Defense Position, negate its effects, destroy it during the End Phase, also you cannot Special Summon monsters from the Extra Deck for the rest of the turn, except DARK monsters. This card is the first Tuner monster to be used in the Yu-Gi-Oh! VRAINS anime, as well as the first Synchron monster used by a rival character. This card is 1 of 5 Synchron monsters whose Type is not Machine; the other 4 being Junk Synchron (Warrior), Synchron Keeper (Zombie), Performapal Odd-Eyes Synchron (Spellcaster), and Cyberse Synchron (Cyberse). It is also the only Dragon Synchron monster. This is the first Rokket monster not to have Dragon in its name.